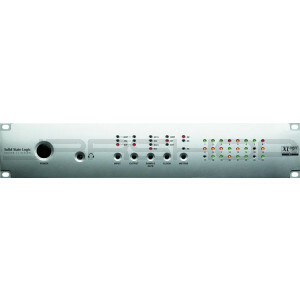 The XLogic Alpha-Link Audio I/O range is a new family of fully featured multi-channel Audio Converters for Studio, Live and Broadcast Applications. The three different models each feature our high quality 24-channel AD/DA converter circuitry. All Alpha-Link units can be used as standalone format converters, but used in combination with a Soundscape Mixpander PCI card they provide a powerful, highly flexible I/O solution for native PC-based audio workstations. The Alpha Link AX shares an almost identical feature set to the Alpha Link MADI AX but strips away the MADI functionality to deliver a super ADAT Lightpipe based SSL enhanced AD/DA solution that hits an impressive price to performance ratio.